Regular window cleaning can be extremely beneficial to Baltimore-based businesses. Your windows are one of the most noticeable and visually interesting parts of your store or business, but if they’re dirty, they are interesting for the wrong reason. They can create a bad first impression of your building which translates to a bad first impression of your business. 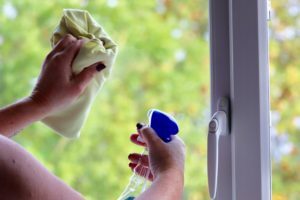 Whether you do it yourself or hire a cleaning service, here are some benefits of regularly cleaning your business’ windows. Clean windows look better, and to maintain that look you need to thoroughly clean your windows two or three times a year. Most offices clean the insides of the windows much more frequently, but the outsides need to be cleaned too. Weather causes dirt and grime to build up on the outside of the windows over time, and that build up can block the sun, cause odd shadows, and simply just look dirty and bad. For a new client, those dirty windows are telling them that you don’t care about and maintain your business (and might cause them to question your ability to do a good job for them). Overtime, the weather that your windows endure can actually start wearing away at them. Factors like acid rain, hard water, and oxidation from sitting water all act as corrosive contaminants and they can cause serious damage if they’re allowed to linger for too long. Regular cleaning with appropriate cleaners removes these contaminants, extending the lifespan of your windows. Clean windows allow more natural light into your business or office, which studies show is an important factor in workplace satisfaction. Employees who can see nature outside are better able to focus, more comfortable, and more productive. If that view is marred by dirty windows, or even completely blocked by grime build up, you and your employees won’t be as comfortable. You will also be more comfortable if you know that your business windows are always presentable, so you never have to worry about clients or customers getting a bad impression. Over time, grime and dirt can build up on the surface of your commercial windows. When this buildup blocks the sunlight coming in, it also makes you miss out on the natural warming action of that sunlight. In the winter, this earth could be helping you keep your heating bills down, but not if the windows are dirty. The glass isn’t the only part that gets dirty either. Corrosion’s and oxidation on the frame can weaken seals and let cold air in in the winter or let cooled air escape in the summer. Either way, it translates to more money spent on heating and cooling your business to keep it comfortable. A 360 Cleaning has provided Maryland with top-notch professional cleaning and janitorial services for over 12 years. We don’t cut corners and ensure that every customer is satisfied with their cleaning. Whether you need a glitter spill cleaned up or an entire office building, we are happy to help! We currently serve the following areas: Baltimore, Annapolis, Glen Burnie, Severna Park. To explore how we can help keep your windows clean all year long, give us a call at 410-852-5800 or visit us online. For more cleaning tips, follow us on Facebook, Pinterest, Twitter, and LinkedIn. This entry was posted on Friday, April 12th, 2019	at 2:25 pm	and is filed under Cleaning	. You can follow any responses to this entry through the RSS 2.0	feed. Both comments and pings are currently closed.